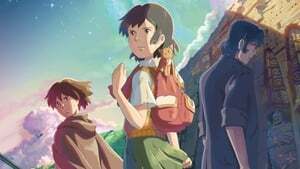 The film centers on Asuna, a young girl who spends her solitary days listening to the mysterious music emanating from the crystal radio she received from her late father as a memento. One day while walking home she is attacked by a fearsome monster and saved mysterious boy named Shun. However, Shun disappears and Asuna embarks on a journey of adventure to the land of Agartha with her teacher Mr. Morisaki to meet a Shun again. Through her journey she comes to know the cruelty and beauty of the world, as well as loss.